Herceg Novi (Montenegrin Cyrillic: Херцег Нови; pronounced [xěrtseɡ nôʋiː]) is a coastal town in Montenegro located at the entrance to the Bay of Kotor and at the foot of Mount Orjen. It is the administrative center of the Herceg Novi Municipality with around 33,000 inhabitants. Herceg Novi was known as Castelnuovo ("New castle" in Italian) between 1482 and 1797, when it was part of Ottoman Empire and the Albania Veneta of the Republic of Venice. It was a Catholic bishopric and remains a Latin titular see as Novi. Herceg Novi has had a turbulent past, despite being one of the youngest settlements on the Adriatic. A history of varied occupations has created a blend of diverse and picturesque architectural style in the city. 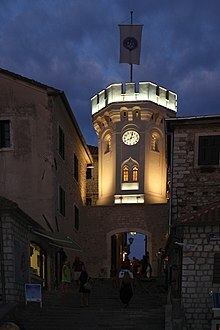 In Montenegrin, the town is known as Herceg Novi or Херцег Нови; in Italian as Castelnuovo; and in Greek as Neòkastron (Νεοκαστρον), all meaning 'new castle'. Archeological findings from Luštica peninsula and Vranjaj cavern imply that the area was populated in Neolothic and early Bronze Age. In 3rd century BC, after beating the Illyrians, the area was ruled by Roman Republic. After the split of the Roman Empire, the area fell under rule of Western Roman Empire. After the fall of the Western Roman Empire, the area was dominated by Byzantine Empire. Slavic tribes began inhabiting these lands in 7th century AD. During these times the small settlement was part of Byzantine-held Dračevica district, which in turn later belonged to Principality of Travunija. In 10th century Dračevica comes under the control of various Dioclean/Zetan dukes, who were in turn incorporated into Kingdom of Serbia ruled by the Nemanjić dynasty. After the death of Emperor Stefan Dušan, Serbian Empire begins to fracture into smaller principalities and districts, Dračevica being administered by great duke Vojislav Vojinović. After the rulership of Vojinović, the area, along with most of modern Montenegro, comes under the rule of Balšić noble family. The medieval town was founded on a small fishing village as a fortress in 1382 by the first King of Bosnia, Stefan Tvrtko I Kotromanić and was originally named Sveti Stefan (Saint Stephen). After the death of Tvrtko, Duke Sandalj Hranić of the Herzegovinian Kosačas acquired Sveti Stefan. During his reign, the town picked up trading salt. When Hranić died, his nephew, Herzog Stjepan Vukčić Kosača inherited it. During the reign of Duchy of Saint Sava, the town grew in importance and became Stjepan's seat, getting a new name in the process: Herceg Novi. Herzog Stjepan also founded Savina monastery. The Turks conquered Herceg Novi in 1482, and ruled for 200 years, until 1687. They built Kanli Tower on the upper edge of the city. However, there was a short pause between 1538 and 1539 when it was held by the Spaniards before they were defeated in the Siege of Castelnuovo. In their brief overlordship, the Spanish built a Hispaniola fort above the city that is well-preserved today. Venice gained control of the city and included it into Albania Veneta, an administrative unit on the territory of present-day coastal Montenegro. In Venice, the city was known as Castelnuovo. The Venetians refortified the old town walls and towers and reinforced the fortress with a Citadella tower (destroyed in an earthquake in 1960s). On 24 August 1798, Herceg Novi was annexed by Habsburg Austria but was then ceded to Russia as per the Treaty of Pressburg on 26 December 1805. The Russians officially occupied Herceg Novi between 28 February 1806 and 12 August 1807. Herceg Novi, as well as the rest of the Bay of Kotor, was overtaken by Montenegrin forces in 1813. 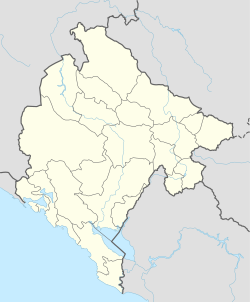 It was under control of a temporary government based in Dobrota between 11 September 1813 and 10 June 1814, which was supported by Montenegro. The appearance of Austrian forces in 1814 caused the Prince-Bishop of Montenegro to turn over the territory to Austrian administration on 11 June. After Herceg Novi was retaken, as well as the rest of the bay, it became part of the Dalmatian crownland. The bay was under Austro-Hungarian control until 1918. It once was a Catholic bishopric, but no residential incumbent data are available. 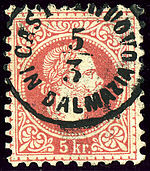 In 1933 the diocese was nominally restored by establishing in the Latin Church of the Catholic Church a titular bishopric of Novi (in Dalmatia), listed as suffragan of the Archdiocese of Doclea (which in Classical times controlled its region in the Roman province of Dalmatia Superior). Titular Archbishop Paul Fitzpatrick Russell (2016.03.19 – ...) as papal diplomat: Apostolic Nuncio (ambassador) to Turkey (2016.03.19 – ...); Apostolic Nuncio to Turkmenistan (2016.03.19 – ...); and Apostolic Nuncio to Azerbaijan (2017.04.07 - ...). The Apostolic Nunciature for all three countries is located in Ankara. Previously, he was chargé d'affaires (head of mission) of the Apostolic Nunciature to China, based in Taiwan (2008.05.02 – 2016.03.19). The Herceg Novi municipality stretches from Prevlaka to the Verige strait. An almost unbroken string of towns lie along this strip of coast, accommodating the municipality's 30,864 (2011 census) residents. These include Igalo, Herceg Novi, Baošići, Đenovići, Meljine and Bijela. Zelenika which is also a small city in Herceg Novi is also a very popular place to visit along the shores of Montenegro. "JUK Herceg-Fest" This cultural events center was established on 24 February 1992. Two years later the cultural center joined with the "Orijen" movie distribution and production company. Together they have played a crucial role in enhancing the city's cultural life. Among many annual festivities are the mimosa celebration, local theatrical events, and a film and music fest. "The Operosa Opera Festival" takes place during the summer in the Kanli Kula amphitheater inside the fortress of Stari Grad (Old Town). The Herceg Novi City Archive was returned in 1956 the Archive to Herceg Novi after being temporarily relocated to Zadar, Croatia. The Archive was relocated to Zadar by Italians during the Second World War. The original archive building, built in 1885, suffered severe damage from the 1979 earthquake. Shortly afterward, the building was renovated. Today, the Archive is 700 m2 (7,535 sq ft) in size. The Archive features modern equipment and a library open to the public. The oldest document in the Archive originated in 1685. The library contains approximately 30,000 volumes and 1,000 periodicals. The Historical Museum was established in 1949 and officially opened in 1953. The museum building, a gift to the city from the former mayor, Mirko Komnenović (1870–1941), and his wife Olga, is at least 150 years old. The City library contains at least 30,000 volumes. Among the contributors to this collection are Dušan Petković (5,000 books), Veljka Radojević (1,500), Doklestić, Daljev, Lučić, Subotić and others. August 2017 panoramic view of Herceg Novi. Herceg Novi or Igalo is usually the final destination of buses that come from inland Montenegro and Serbia. The Adriatic Motorway, a two-lane motorway that extends for the length of the Montenegrin coast, goes through Herceg Novi before it merges with the Croatian road network at the Debeli Brijeg border crossing. Tivat Airport is 23 km (14 mi) away (via the ferry). There are regular flights to Belgrade and Zürich, and dozens of charter planes land daily on Tivat airport during the summer season. Dubrovnik Airport in Croatia is some 30 km (19 mi) away, and it maintains regular flights to many European destinations. A pomegranate tree near the bus station in Herceg Novi. September 2018. The area of the Bay of Kotor has a humid subtropical climate (Köppen climate classification: Cfa) with significantly more rain in the winter than in the summer. Herceg Novi has a specific microclimate, which is a result of southern exposition, proximity to the sea, limestone substratum and mountainous hinterland which prevents the breakthrough of cold air masses. ^ a b "Results of the 2011 Census of Herceg-Novi". Herceg Novi municipality. Retrieved 31 July 2017. ^ "Nacionalna ili etnicka pripadnost – Podaci po naseljima i opstinama" [National or ethnic affiliation – Data by settlements and municipalities] (compressed PDF). Popis stanovništva, domaćinstava i stanova u 2003. Zavod za statistiku Republike Crne Gore. September 2004. Retrieved 29 July 2014. ^ "Climate: Herceg Novi". Hydrological and Meteorological Service of Montenegro. Retrieved May 26, 2018. ^ "Sito del Comune - Gemellaggi ed opportunità". Comune di Barletta (in Italian). Archived from the original on 2016-03-05. Retrieved 2013-06-25. Wikivoyage has a travel guide for Herceg Novi. Wikimedia Commons has media related to Herceg Novi.